See Stefan Zucker discuss Slezak and Schmidt. The clips are from the 13-part series The Tenors of the 78 Era (Die Tenöre der Schellackzeit). The DVDs are out of print. The films originally were shown on Germany’s ARD network (and ultimately were seen in 48 countries). Because my German grammar is faulty I was reluctant to discuss the tenors in that language, so the director, Jan Schmidt-Garre, encouraged me to sprinkle in some German words: “Nachklang” means “echo” and “vorne” means “forward” (as in “forward placement”). I don’t discuss Slezak or Schmidt in Franco Corelli and a Revolution in Singing: Fifty-Four Tenors Spanning 200 Years, so I thought some of my observations about them might be of interest. Filippo Moratti Accurate as usual, Stefan. Jon Fredric West In regards to Schmidt: Yes, such a great lyric tenor, and all your thoughts and comments are spot on. 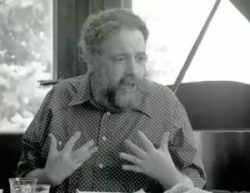 My added thoughts are simply that I feel his technique was strongly influenced by the classical use of the voice, that is to say the operatic side of the issue, and that also influenced his cantorial work to a degree. Schmidt reminds me of Wunderlich quite a bit, but Schmidt’s voice was lighter, probably smaller, and with an incredibly easy top. Yet he could be monochromatic, as you comment, and seemingly used dynamics as the only variant rather than onomatopoetic color. That said, in songs of less formal character, such as the songs from the live performance at Carnegie Hall and the gorgeous “I Hear You Calling Me” (a John McCormack favorite) he proves that he could, when moved, become quite expressive. Slezak, for me, was another case entirely. One might say a career in reverse. He was a great dramatic tenor who seems to have wanted to sing everything, whether his voice was right for the role or not. A formidable Otello, a magnificent Eleazar (one the Viennese audience still holds as a standard bearer against whom all others are judged, particularly in his reading of the dramatic recitative before “Rachel quand du Seigneur”) a great Canio, Florestan, Manrico, etc. Yet even in a time before the “Fach” system had a chokehold on artists, there is a limit to what your voice should (not could) do. He should have sung “Viens, gentile dame” (in German, as “Komm, o holde Dame”) as a studio study in flexibility for a dramatic voice, not an aria that should have been performed in public. Only a voice such as Wunderlich, Schmidt or lighter should have performed such roles. Then, as he grew older, his fantastic artistry came to dominate his vocal technique. Yes, he had a phenomenal mezza voce and unbelievable understanding of onomatopoetic vocal colorations, but to facilitate the growing dependence on this side of his art he began to “forget” his real voice and sing too light, too bright and too white. This art-song technique helped to destroy his real rounded and full dramatic sound. At the end, in my opinion and others’, his voice was a shell of itself. That criticism said, he was still a top-ranking tenor, and his feeling and soulful understanding of text can take me to a place no other artist can. And what a great comedic actor!